Our home is a large-scale home on a 1000sqm section. It features a whopping 280 square metres floor space. It provides the perfect space for families or larger groups. It is located in the sought after suburb of Hilltop, 200 metres away from Hilltop school which has playgrounds and area for kids of all ages. A 20 minute walk, a 10 minute bike ride, or a 3 minute drive and you are in Taupo retail area. The home is located in a safe neighbourhood, has privacy, and has excellent views from both levels. With a lounge, a sitting room, and a rumpus room our home handles larger groups comfortably. The spacious kitchen has everything you need, and also includes an espresso machine. Downstairs is heated in winter months with roaring gas fire in the sitting room and a 6kW heat pump down the hall. The upstairs bedrooms are heated with an 11.2kW ducted heat pump system to each bedroom. Whether you're in Taupo to ski Mt Ruapehu, trout fish the Tongariro, ride around the lake, drive Bruce Mclaren Motorsport Park, compete in a multi-sport event, or waterski on Christmas day - our home is your ticket. With over 400 books, a selection of family board games and two TV's with freeview and DVD players, there is plenty to keep everyone entertained. Stag, Hen's, or partying groups are strictly forbidden. In accepting a booking at this property guests accept any liability associated with the eviction of such groups. 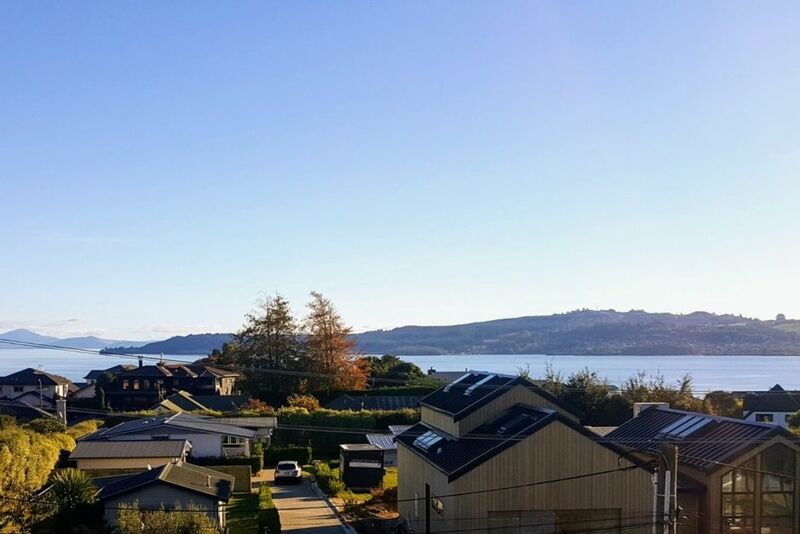 Excellent views of Lake Taupo on sunny 1000sqm section. Do not use the oven timer - it can cause the oven to turn off! There is a timer on the range hood. Good roomy home. Nice large section - work well for the grandchildren to play safely. Essential items in the kitchen. I did go out and buy a cheap frypan- and beater- more to cater to what we had planned in way of meals. We did make use of the barbecue every day. Just have to watch the fall of leaves etc from the trees while cooking. If you are a flannel user - then take your own as these were not provided. Good location. Nice stroll to De Bretts or 15 to 20 min walk to town. This is an awesome house for a large group, plenty of space and facilities. Hosts were excellent and even cleared the garage for our bikes to park. Definitely booking again and would recommend! Great house, everything you need for a comfortable stay. Would definitely recommend!! Stayed here two years running now and will definitely book again! Owners great to deal with and the house met our needs in every way. Very nicely presented, lovely home with lots of space.. close to local amenities with a lovely view. Only issue we had was the hot water. The hot water runs out if two or more showers are on at the same time.. overall it was good.